Learn or Listen to Free Creole ebook Audio: Excerpt Pages 33 to 43 From "Learn / Listen to Haitian Creole MP3 Dialogues, Phrases, Words, Audio Expressions..."
This ebook is written and this podcast episode is produced by Mr. Joseph J. Charles, founder of 'HaitianCreoleMP3.libsyn.com' who agreed to release these educational materials for the teaching, diffusion, and promotion of Haitian Creole and culture! In this episode covering pages 33 - 43 of the ebook, "Learn/Listen to Haitian Creole MP3 Dialogues, Phrases, Words + Audio Expressions and Sayings for Everyone Everywhere,"you will learn about how to order your meals in a haitian restaurant, how to negotiate the price of your meals, how to ask for a correction of an error on the check or (fich in Creole. You will also learn about 'Lanmou nan tan epidemi kolera - Love in the times of Cholera,' the story of a handsome American doctor (Ben Cardozo) who fell in love / head over heels for a beautiful Haitian woman (Darline Byeneme, Bien-Aime) who became his Haitian culture and language teacher. You will also learn new words such as toilet paper (papye ijyenik), menstrual cramps (kranp), headache, earache, sore throat - maltèt / malzòrèy / malgòj, Ben's reflections on practicing medicine in a poor country such as Haiti "Practicing medicine in a poor country such as Haiti is very difficult but it is worth it - Pratike medsin nan yon peyi pòv tankou Ayiti difisil. Se gwo tèt chaje. Men sa vo lapèn." In this episode, you will also find the review of question words in some key exercises. You will also learn words to translate alternative lifestyles in Haitian Creole. This ebook was written with your needs in mind. The episodes are designed to allow you to listen to real-life, Haiti-based dialogues about life's issues. You will be placed in local situations where you will have to find the right words to express your thoughts. "Learn/Listen to Haitian Creole MP3 Dialogues, Phrases, Words + Audio Expressions, Sayings for Everyone Everywhere - Aprann/Koute Dyalòg MP3, Fraz, Pwovèb, Mo + Odyo Ekspresyon Kreyòl Pou Tout Moun..."
"Learn/Listen to Haitian Creole MP3 Dialogues, Phrases, Words + Audio Expressions, Sayings for Everyone Everywhere - Aprann/Koute Dyalòg MP3, Fraz, Pwovèb, Mo + Odyo Ekspresyon Kreyòl Pou Tout Moun..." is a podcast-compatible (http://haitiancreolemp3.libsyn.com) series of MP3 dialogues, phrases, words, and audio expressions whose focus is to get you to speak and understand Haitian Creole in a short time. The lessons are designed to get you out of your comfort zone and place you into various Haitian locales where you will most likely hear and practice the language. Each lesson is designed to help you build your vocabulary and increase your cultural knowledge. If you like "Learn Haitian Creole in One Week..." and other similar titles, you will like this ebook too. 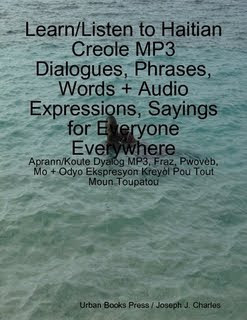 Go to http://haitiancreolemp3.libsyn.com to get the accompanying audio or MP3 files.